Author: Anthony, Patricia Set In . . . Description: Patricia Anthony’s critically acclaimed debut novel, Cold Allies was selected by Locus Magazine as the best first novel of 1993. Into the crossfire of a great World War, into its last desperate struggles, a new, enigmatic player intervenes: A force of aliens who appear as cold blue globes of light hovering over the bloodied battlefields of a dying Earth. ... and no one knows what they want or which side they’re on. The light halted. Gordon had the eerie sensation it was regarding him. A sort of wintry lassitude weighed him down, the same placid comfort that precedes a death by freezing. His eyes started to close. Faintly, in the back of his mind, he could hear the monotonous tap-tap-tap of sleet striking a window. He shook himself out of the half-sleep, and his eyes popped open to darkness. He’d inadvertently shut down the CRAV. He gasped. Violently he jerked his head twice to the right. The vision field came back. The blue light was closer, right at the fence; and he could sense, as he could feel his robot arms and treads, the light’s intense curiosity. “Arm missiles!” he screamed. The heads-up display sprang into life. The blue light was square in the center of the kill box. The words MISSILES ARMED, MISSILES ARMED marched in red across his vision. He touched the stud in the little finger of his left glove and tried to bring it into contact with his thumb. His hands were shaking like a drunk with the d.t.’s. Jesus God. He didn’t have the strength to push his fingers together hard enough to fire. 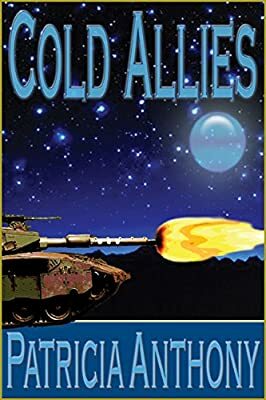 COLD ALLIES — 1993 winner of the prestigious Locus magazine readers’ poll for best first novel of the year.